You might think you know how to do double denim—a pair of jeans and a matching shirt, right?—but the classic Canadian tuxedo has just adopted an outgoing (and rather European) alter ego for 2018. The combination to be seen in now still revolves around a pair of jeans (in fact, any jean style is acceptable, including white jeans), but the update lies in the new twist on both the top and bottom half. Rather than a simple button-down, new-wave jean freaks are eschewing blouses and tees altogether and selecting true-blue denim jackets instead, only to button them up, push or slouch them off shoulders and reveal a slice of collarbone. As for the bottom half, it's all about new, interesting styles. Sure, you can still go for the straight-leg, raw-edge jeans, but why not a cropped pair or culottes? There are so many ways to mess around with the double-denim look this year. Like almost all wildfire trends of late, the lineage of this can be traced back to Vetements. Creative Director Demna Gvasalia first ignited the idea in his brand's S/S 17 menswear collection (minus the shoulder exposure). Rihanna followed suit, translating the combination into party territory by swapping skinnies for a short denim mini. Her jean jacket of choice was a street style–approved £595 creation from Demna's other fashion home, Balenciaga, and it's unsurprisingly sold out. But that doesn't mean you've run out of options. We've selected some of the hottest Canadian tuxedo looks—keep scrolling to see how to do it and shop some vital pieces. Style Notes: If you don't want to look too obviously double denim, try wearing a chunky knit and a matching scarf to detract away from your Canadian tuxedo. These are some of the best straight-leg jeans on the high street. Style Notes: Mix your denim up, and opt for a light pair of jeans on the bottom and a darker, oversized jacket on top. You could even try the mismatched boots thing for a super-"fashion" ensemble. The great news is that this piece is utterly versatile. Style Notes: The white jeans–and–classic denim jacket look is an ensemble everyone should be ready to pull out of their wardrobes come summer. Just keep it up to date with a pair of straight-leg jeans. No, you can't go wrong with these. Style Notes: Denim shoes might raise a few eyebrows, but we guarantee they're chic. Pair with your jeans and jacket, but wear your favourite midi dress to break up the monotony of blue. Trust Giavnito Rossi to do the coolest denim heels. Style Notes: Ripped, frayed-hem, and wide-leg denim can look just as great as straight-leg versions. Frayed at the hem if you don't want to go for the full-on ripped look. Style Notes: Feel that your denim needs to be livened up a bit? When it's cold, add a puffer coat, and wear it with bright shoes and a bold bag. Winner. One of our favourite denim brands makes the softest jackets. Style Notes: Worried your Canadian tuxedo won't look luxe enough? Wear a pair of red court shoes and a white tee underneath for maximum sophistication. Just don't forget the sunglasses. M.i.h does some of the softest jeans around, and this pair fits perfectly. Style Notes: Make this outfit combo look ladylike by going for a jacket with an embellished collar. Even better, add a stylish hat and a pair of court shoes to give it a polished edge. This will keep you warm in winter but look great come spring/summer slung over your shoulders. Style Notes: Denim jackets don't have to be oversized. Instead, opt for a fitted piece that will hug curves. Pair with culotte jeans. The darker hue will make these jeans super flattering. PS, guess who's into large turn-ups on jeans right now? 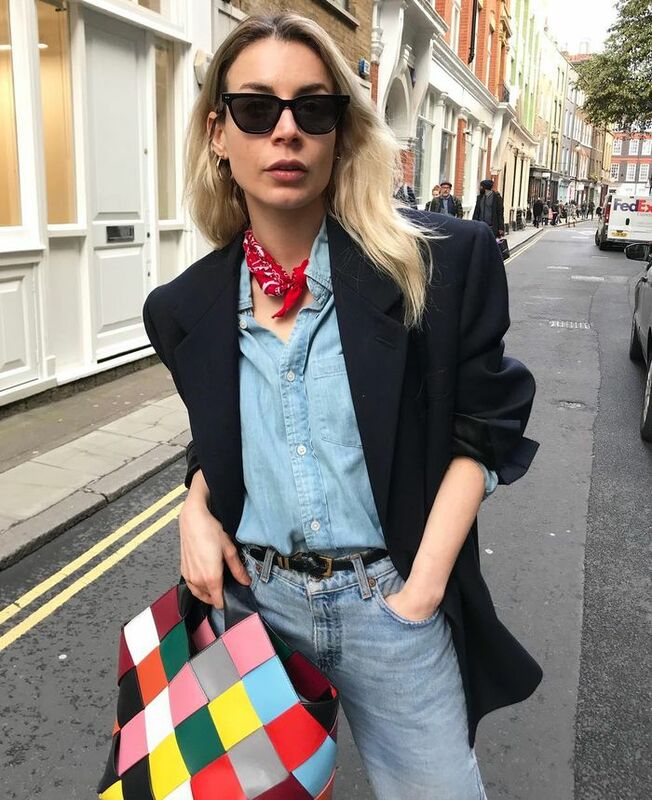 Style Notes: Wearing an asymmetric denim jacket and tucking it into frayed-hem straight-leg jeans is just one super-simple but incredibly cool way to do this look. Just make sure to add a pair of floral boots (preferably Balenciaga). Balenciaga's denim jackets are cult buys, so get this one before it sells out. Style Notes: An oversized denim shirt can work just as well as a jacket, but its ability to be tucked in makes it more versatile. A darker shade on top and lighter on the bottom can look flattering too. From one of our favourite brands right now. This post was originally published at an earlier date and has since been updated by Elinor Block.